The Learning Systems Platform, launched by the BMBF in 2017 and whose steering committee includes Prof. Dr. Dr. h.c. mult. Wolfgang Wahlster, brings together expertise from science, industry and society to position Germany internationally as a technology leader for learning systems. The members of the platform are organized in seven interdisciplinary working groups and a steering committee, who compile the current state of knowledge on Learning Systems and Artificial Intelligence. The working group "Technologische Wegbereiter und Data Science" (Technological Trailblazers and Data Science), under the direction of Prof. Markl and Prof. Katharina Morik, TU Dortmund; deals with the technological basics and enablers of learning systems. It assumes a cross-sectional function within the platform and gives impulses to all other working groups. 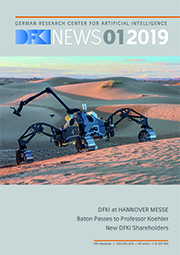 Its focus topics include the analysis of strengths and weaknesses of German AI research and the derivation of needs for action for training and future research. A contribution to the Stanford AI Index is also planned.